What happens when you mix Star Wars with Cute Overload? 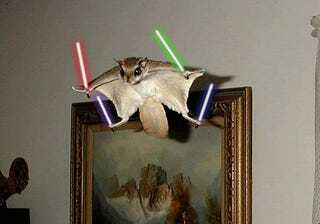 Animals with Lightsabers, where Sith cats, Jedi dogs, and the flying squirrel answer to General Grievous duke it out. Also over at Animals with Lightsabers are a couple of videos of canines showing off their Force powers, and pre-made lightsaber images so you can add them to your own pets' photos.